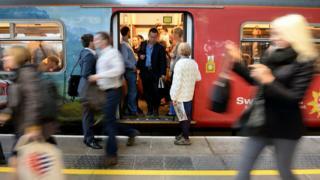 Campaigners for better railways said people were "astonished" so much of their income was going on travel. Passengers travelling between Harlow Town and London Liverpool Street pay the most per mile for their commute. A season ticket costs £3,432 a year, which works out at 38p per mile when used for a round trip five days a week, excluding weekends, bank holidays and 25 days' annual leave. Natasha Ellingham said: "Since April I've said goodnight to my daughter on the phone. It's extra childcare costs. People with children are not getting home to see their kids at night." "I've got a young family and it just meant I never got to see them," he said. "By the time I arrived in they were getting ready to go go bed so we didn't really have much time to spend together." James MacColl, head of campaigns at the Campaign for Better Transport, said: "Fares are so high for some routes that season tickets now make up a big proportion of household expenditure for many commuters. "With passengers on some of the most expensive routes also experiencing worsening overcrowding, delays and cancellations, they are often left astonished that they're being charged even more for the privilege every year. "Short term, passengers must be assured they'll get proper compensation for disruptions, and fair ticketing must be introduced nationwide, including the long-promised and long-overdue part-time season tickets. "Long term, it's essential that passengers are given a proper say in how rail franchises are secured and managed, and for the link between fare rises and the outdated Retail Price Index to be scrapped once and for all." Rail Minister Paul Maynard said: "Wages are growing faster than train ticket prices thanks to action by the Government and our commitment to cap regulated rail fares in line with inflation will save annual season ticket holders £425 on average in the five years to 2020. "Passengers want better services that get them where they need to go. We are investing record amounts in our railways delivering the biggest rail modernisation programme for over a century, providing more seats, more services and better facilities on the trains. "When train franchises come to an end, new operators will be required to introduce more flexible tickets for part-time workers. This could include multi-buy discounts to provide passengers with a better deal." A spokesman for the Rail Delivery Group, which represents train operators, said train travel was "extremely good value compared, for example, with buying, insuring and filling up a car". He said: "Part-time season tickets are something that, with the government, we're looking at. The way people work is changing and we understand that. Some train companies already offer deals that are suitable for part-time workers. "As we modernise and move to smarter types of ticketing it will be easier to offer part-time season tickets."